http://www.JewishWorldReview.com | "What happened," asks Michael Oren, "to Israel's reputation?" The Israeli ambassador to the United States, a noted historian, combat veteran, and bestselling author, raised that question in a Wall Street Journal essay last week. 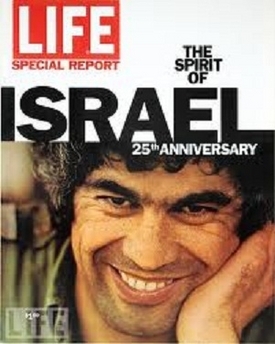 Writing on the 64th anniversary of Israeli independence, Oren began by quoting from Life magazine's salute to the Jewish state on its 25th birthday in 1973-- a 92-page special issue that honored the "astonishing achievement" of modern Israel, an island of enlightened democratic courage flourishing against all odds amid a sea of Arab hostility and violence. From "a tiny, parched, scarcely defensible toe-hold," Life declared, the people of Israel had forged "a new society ... in which pride and confidence have replaced the despair engendered by age-long suffering and persecution." Needless to say, media descriptions of Israel today are rarely so admiring. When the spotlight turns to Israel now, it is typically harsh and unflattering. Though Israeli society remains robustly democratic and free, though its dictatorial and jihadist enemies still yearn to see it wiped out, international opinion treats the Jewish state as a pariah. Israel is accused of lurid war crimes and smeared as an "apartheid" regime; it is routinely portrayed by UN panels and campus activists as an occupying Goliath brutally oppressing a Palestinian David. "Why has Israel's image deteriorated?" Oren asks. "Why have anti-Israel libels once consigned to hate groups become media mainstays?" Especially now, after nearly two decades in which Israel has gone to such extraordinary lengths to end its conflict with the Palestinians. The concessions Israel has made in pursuit of peace are unprecedented in diplomatic history. Oren mentions some of them: Recognizing the PLO as a diplomatic partner, creating an armed Palestinian Authority, twice offering the Palestinians a sovereign state, agreeing to share control of Jerusalem, removing every Jewish community in Gaza, and repeatedly inviting Palestinian leaders to negotiate without preconditions. Given all this, Israel's ambassador wonders, why is Israel so bitterly demonized? His answer -- that Israel's enemies have undertaken a "systematic delegitimization of the Jewish state" -- merely begs the question. With everything Israel has done to prove its goodwill, with the deep sacrifices it has offered in its quest for peace, why should a campaign to blacken Israel's image be achieving such success? Why is Israel's reputation so much worse today than it was before Yitzhak Rabin and Yasser Arafat shook hands on the White House lawn 19 years ago? The real answer is that Israel's global standing has been debased not despite the "peace process," but because of it. For 19 years Israel has clung to a policy of appeasement that has made it seem weak and irresolute -- a policy that successive Israeli governments have justified by denigrating Jewish rights to the land, while playing up the Palestinian narrative. Ehud Barak infamously said in 1998 that if he had been a Palestinian, he might have joined a terrorist group, and that "there is legitimacy for a Palestinian to fight." Were an American presidential hopeful to suggest that under other circumstances he could see himself becoming an al-Qaeda terrorist, his White House ambitions would instantly implode. But Barak's remarks didn't prevent him from becoming prime minister. With its embrace of the peace process, "Israel stopped defending its own claim to the West Bank and Gaza and instead increasingly endorsed the Palestinian claim," Israeli journalist Evelyn Gordon has written. "And with no competing narrative to challenge it any longer, the view of Israel as a thief, with all its attendant consequences, has gained unprecedented traction." Britain's Neville Chamberlain abandoned his appeasement strategy once it became clear that Adolf Hitler had no intention of making peace. But Israel has gone on making concession after concession to those who seek its destruction, clinging against all logic to the fantasy of a "two-state solution." Once, it was agreed by Israeli governments left and right that a Palestinian state would be intolerable; that there could be no negotiating with the PLO; that diluting Jewish sovereignty over Jerusalem would be unthinkable. Yet in its desperate quest for peace, Israel backed away from each of those red lines. With each retreat, it lost respect. And all the while it reinforced a false and terrible message: Peace would be possible if only Israel were willing to give up more. The absence of peace, therefore, must be Israel's fault. The 19-year disaster of the peace process -- that is what happened to Israel's reputation. How can the Jewish state get its good name back? Step 1 is to jettison the policy that has caused it such harm.